South Korea is turning its attention to solar-plus-storage. 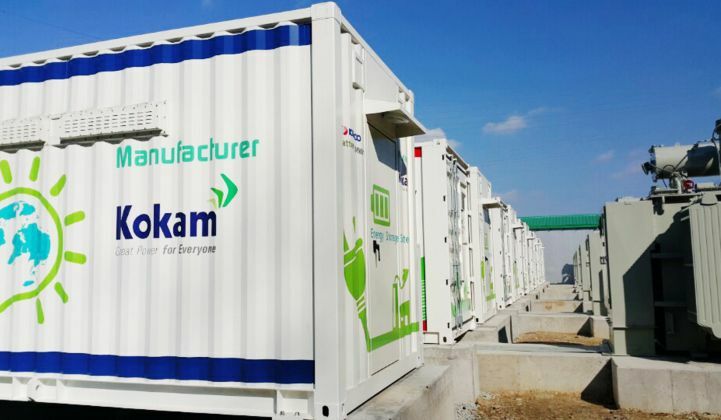 Kokam has announced 40 megawatt-hours of solar-connected battery capacity in South Korea as the market shifts to PV-plus-batteries for energy storage growth. The SolarEdge-owned South Korean lithium-nickel-manganese-cobalt oxide (NMC) battery maker said the new capacity would be spread across two projects and multiple sites. The largest project, comprising 8 megawatts and 28 megawatt-hours of battery capacity, sits alongside 10 megawatts of PV across nine plants owned by Korea Midland Power, a subsidiary of Korea Electric Power Corporation (Kepco). The other project will see 5 megawatts and 12 megawatt-hours of battery storage attached to 5 megawatts of PV across three sites being developed by the engineering, procurement and construction contractor Razzler in South Korea’s Chungcheong region. Kokam said the battery capacity would be installed and operating before the end of the year. Most of the Korea Midland Power capacity would use a new high-energy battery design with more than 204 watt-hours of energy density per kilogram, the company reported. The PV-plus-battery projects underscore a growing trend of developers pairing storage alongside solar in South Korea. The nation is hoping to grow its share of renewable electricity generation from 4 percent in 2016 to 20 percent in 2030, under a plan released in December 2017. The plan foresees adding 48.7 gigawatts of renewable energy to the country’s electricity mix between 2018 and 2030. Of this, 63 gigawatts will be solar, which the government fears could destabilize the grid if not coupled to some form of energy storage system (ESS). “South Korea is encouraging the installation of ESSs with PV systems because ESSs address several of the problems caused by the intermittent energy generation of renewable resources,” said Kokam in a press note. Regulators also envision storage helping with renewable ramp-rate control and providing other ancillary services to maintain grid stability, Kokam said. In 2017 the government announced measures to support renewables-attached storage through the renewable energy certificates (REC) awarded within the country’s renewable portfolio standard scheme. Under the policy, solar energy discharged from batteries between 4 p.m. and 10 a.m. has a REC weighting of 5, meaning producers get five RECs per megawatt-hour of electricity they provide. For comparison, utility-scale solar has a REC weighting of 0.7. The solar-plus-storage REC credit is due to last until the end of next year, said Ike Hong, vice president of Kokam’s Power Solutions Division. From 2020, the REC weighting for solar plus storage will drop to 4. Hong said the policy is attracting South Korean energy storage developers away from commercial and industrial (C&I) installations, which up to now have enjoyed government incentives. “Until 2017, C&I was very dominant,” he told GTM. Hong said he believed interest in the pairing will continue even after the solar-plus-storage REC credit drops in 2020. “This is a long-term trend,” he said. Much of the investment in solar-plus-storage is set to come from Kepco generating divisions such as Korea Midland Power, he said. Kepco itself does not operate generating assets but was responsible for early South Korean grid-scale battery installations designed to provide ancillary services such as frequency regulation.